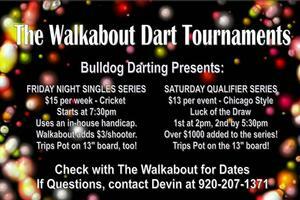 Bulldog Darting Presents the Walkabout Saturday Qualifier Series! There will be 2 events - $13 per event. The first will start at 2pm and the second will start no earlier than 5:30pm. Over $1000 added to this series! This year's format will be Chicago Style LOD, best 2 out of 3. The winners bracket will play 501, cricket, 701. The losers bracket will play 301, cricket, and 501. Qualification Requirements: There will be 32 spots open for the finals. 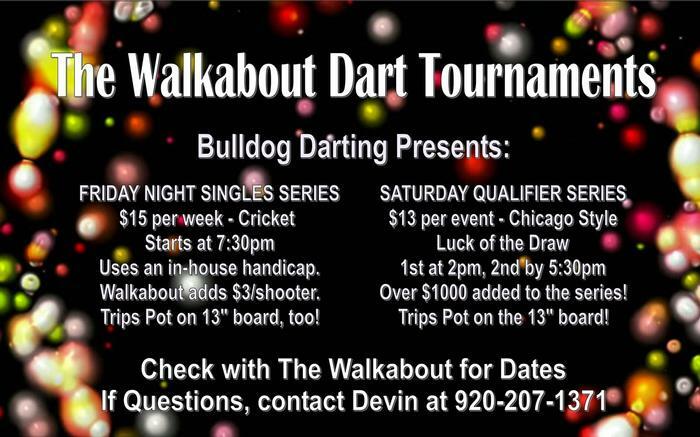 If you take 1st in any of the posted events, you automatically qualify for the finals. The remaining spots will be filled based on POINTS. ?This year's top 3 point leaders and top women's shooter will be GUARANTEED $400 paid out. There will still be a Trips Pot - and it will be shot on the 13" board!